– We have reviewed a number of free antivirus software so far and we will continue to tell you about all good antivirus software that we come across. But, which is the best among the free antivirus software for windows 7, vista or windows xp? To address it, we have listed here our selection of the best free antivirus software in 2011. All these computer security software are good and offer all the basic protection that you do expect out of a free antivirus software i.e. antivirus, anti-spyware, anti-rootkit, anti-dialer and anti-phishing protection. But each one of them has its own pros and cons. Among this list, what is best for one user may not be the best for another user, as the choice depends upon the users’ system resources and their needs. The free avast antivirus software is rich in features and also good in performance, since it consumes lesser RAM compared to others. Amongst the free software, it is definitely one of the best in terms of features, since it provides users with the following extra shields, other than the usual protection. You can also run avast on computers that don’t have an internet connection, and keep it manually updated with avast antivirus update. However, avast is free only for Personal or Home use. 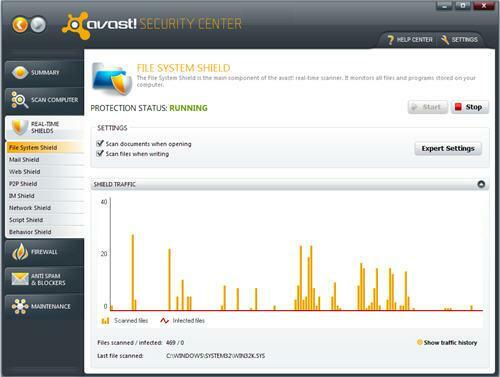 Do Check out the complete list of avast free antivirus 5 features. Update: You can now download avast free antivirus 6.0 Edition. 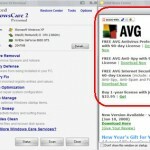 AVG is another popular free antivirus software vendor and their latest free product is AVG 2011. Avg antivirus is also free for personal use and for small businesses in a few countries. The free version does offer core protection against any kind of threats. In addition, AVG has now included a new social network protection module i.e. protection against any threats while you visit social networking sites like facebook, twitter etc. It also offers identity protection and a link scanner that offers real time protection against malicious websites and links, by letting you know whether they can be trusted. AVG antivirus also provides some extra features which you may not even find in the current edition of the free avast antivirus software. In addition, AVG antivirus is known for its fast scans. However, AVG antivirus does throw a number of false positives and there were a few AVG update problems reported with a recent update of AVG 2011. The other annoying thing about AVG antivirus is it does try to install third party tools, but they are optional, and you can get rid of them if you are careful during installation. Microsoft had come out with its own free antivirus software – Microsoft Security Essentials for Windows 7, windows vista and XP. Note that the Microsoft Security Essentials for Windows XP works only on SP2 or above and not on SP1. Further, users should have genuine windows OS running on their system to install this security product. Though a late entrant, it is definitely one of the best free antivirus software in the market. It is not only free for personal use but is also a free antivirus software for small businesses. Microsoft Security Essentials has good detection rates and it also throws less false positives. Though Microsoft Security Essentials for Windows offer a quick scan and a full scan, the full scan takes more time. Tests have shown that this antivirus software is not as good in performance as the other free antivirus software mentioned in this article. However, Microsoft has done well to give you better control over CPU usage i.e. you can limit the CPU usage, during scans, through its settings. 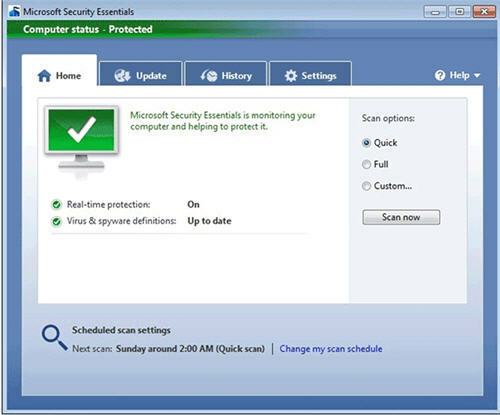 Microsoft Security Essentials monitors all activities like sending and receiving of information through the computer and any other kind of intrusion that works in the background. You can check out the Microsoft Security Essentials review for a complete list of features and improvements in MSE 2.0. 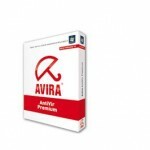 Avira antivirus personal edition is another good free antivirus software for windows. It offers behavior-based protection with “AntiVir ProActiv”. It also provides some sort of basic phishing protection and parental control. 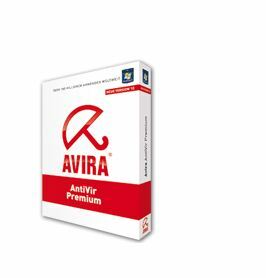 You can check out the other features offered in the free edition of avira antivirus that includes antivirus, anti-spyware, anti-rootkit protection and quick removal of viruses. Avira antivirus has one of the best detection rates, though it may not be as good in performance as AVG or Avast. 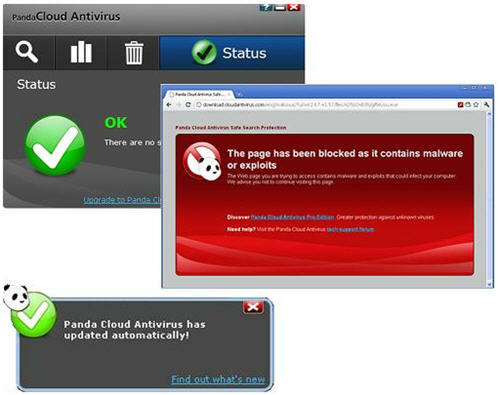 Unlike the other free antivirus software, Panda is a cloud antivirus software. All thread related information are centrally located on their servers and users computers’ are scanned for those threats. Since it resides on their servers, Panda antivirus offers high-level protection in real time. It also helps in freeing up the computer’s system resources by identifying and processing viruses quickly and automatically, as and when needed. Panda cloud antivirus not only offers real-time protection, but it also significantly improves performance since most of the components reside on their servers and not on your computers. It is thus often the best antivirus software for computers with low RAM or processing power. Example – netbooks. Check out the other features and how to activate and use the panda cloud antivirus. Enjoy the best free antivirus software. Excellent free softwares. I personally like the free avast anti-virus released in 2011. It is definitely the best free antivirus for windows. How is AVG 2011 Free Edition? Read a review here at Techblissonline that it cause a few major problems in windows recently.Has this been fixed now? Thanks for the reviews – I need a new antivirus system and have no idea what’s what, so very handy. Nice post. I have AVG installed on my PC and it works very good providing the needed protection from all kinds of threats. I had AVG and it made my computer run slower. Then I downloaded Avast and it was so much better. And it truly is fast when it blocks viruses off the web. Thanks avast. i have been using microsoft securit essentials for one year and in my view its the best AV so far.its light and very easy to update and at the same time effective.